Below listings are available for dates selected. Enjoy panoramic views of Gull Lake from both the living room and bedroom from these new 596 sq. ft. one bedroom suites completed in 2017. You will appreciate the nautical interior design inspiration. The master bedroom features a king size bed. There is a sofa sleeper, armchair, and coffee table in the living room. The kitchen features full size four burner glass top range w/oven, under cabinet microwave, and apartment sized refrigerator/freezer. Enjoy panoramic views of Gull Lake from both the living room and bedroom from these new 596 sq. ft. one bedroom suites completed in 2017. You will appreciate the nautical interior design inspiration.The master bedroom features a king size bed. There is a sofa sleeper, armchair, and coffee table in the living room. The kitchen features full size four burner glass top range w/oven, under cabinet microwave, and apartment sized refrigerator/freezer. Enjoy panoramic views of Gull Lake from these new 517 sq. ft. suites completed in 2017. 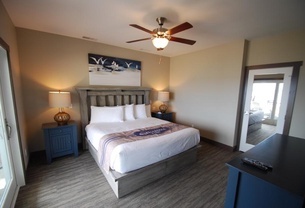 You will enjoy the nautical interior design inspiration, These suites feature two queen beds with a Large fieldstone gas fireplace with reclaimed wood accents. Enjoy panoramic views of Gull Lake from these new 517 sq. ft. suites completed in 2017. You will enjoy the nautical interior design inspiration. 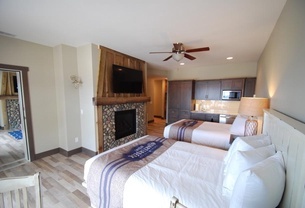 These suites feature two queen beds with a large fieldstone gas fireplace with reclaimed wood accents. Enjoy panoramic views of Gull Lake from both the living room and bedroom from these new 596 sq. ft. one bedroom suites completed in 2017. You will appreciate the nautical interior design inspiration,The master bedroom features a king size bed. There is a sofa sleeper, armchair, and coffee table in the living room. The kitchen features full size four burner glass top range w/oven, under cabinet microwave, and apartment sized refrigerator/freezer.